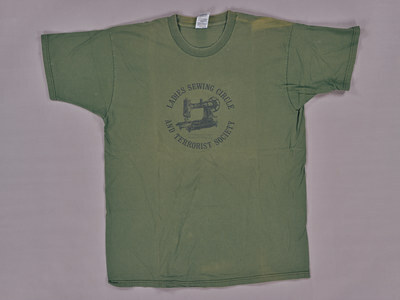 ""LADIES SEWING CIRCLE AND TERRORIST SOCIETY""
"LADIES SEWING CIRCLE AND TERRORIST SOCIETY"
Green t-shirt. Text: “LADIES SEWING CIRCLE AND TERRORIST SOCIETY"
""LADIES SEWING CIRCLE AND TERRORIST SOCIETY"" (2016). T-Shirts. 219.